Jace, Izzy, and Alec chase a Seelie through the streets. Jace follows him into the sewers and they fight; he gets stabbed by the spear. 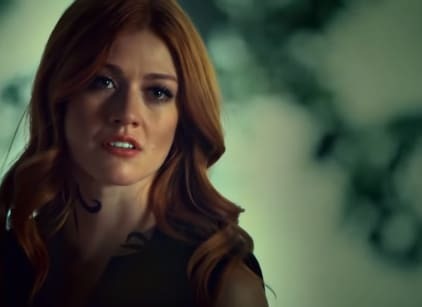 Izzy arrests the Seelie on behalf of the Clave. Jace blames himself for Clary's death. Simon is heartbroken over Clary's death; he tries to cut the mark off his head, but the power pushes it away. Maia gives him a hug. Magnus and Alec perform a memorial for Clary. Jace visits Clary's old room and cries when he finds her drawing of him. Clary wakes up in a fancy apartment to find Jonathan Morgenstern in his true real face. He reveals Lilith is back in Edom; Clary was asleep for days. The mark Lilith carved into Clary is what brought Jonathan back to life. Lilith transported the penthouse to Siberia for protection. Jonathan promises to protect Clary since she's the only family they have. Clary makes a run for it in the snow. Magnus and Alec agree to look after Madzie while Catarina is at a convention. Maia had gone back to Ocean City to clear her head. She wants to get Simon out of the apartment, but he won't risk hurting anyone else. Izzy wants Alec to bring up to the Gard that they've been torturing Downworlders. Izzy finds Jace beating himself up over his memories of the Owl. She makes him promise to not hurt himself again. Madzie uses her powers to make a nightlight; Magnus still has a hard time adjusting without powers. Iris portals in and tries to take her granddaughter away. Clary collapses in the middle of the snowy field by exhaustion. The New York Institute starts a search for Iris. Alec forces Jace to take some time off to clear his head. Jace vehemently refuses, but he reluctantly agrees. Izzy throws it in Maia's face that she wasn't around when Simon had to manipulate his mother's mind. Maia needs Izzy's help to get rid of Simon's mark. Jonathan finds Clary passed out in the snow. Iris portals into the street and starts fighting with Izzy, Alec, and Magnus. She traps Magnus and portals him away with her. Jonathan wants to change and be good, but Clary is hesitant to believe him. Luke is hiding out in a motel and taking time away from the pack. He reveals that Ollie, Sam, and the others from Lilith's followers were given new identities away from New York. Luke is obsessed with searching for Clary. He believes she's still alive and that Lilith used her abilities to transport her away. Iris holds Magnus as a prisoner. She dives into his memories to search for the location of her granddaughter. At the NYC Institute, Izzy comes up with a plan to use Madzie as bait. Maia convinces Simon to search for Rafael. Simon finds him in a food kitchen; he needs his help to remove the mark. Rafael doesn't know how, but he thinks that the oldest vampire in the world might be able to help. The vampire is hiding under New York City. Iris receives a magical message from Catarina to hand Madzie over to her. The figure of a little girl stands in the alleyway; the figure is a diversion from Seelie magic. Alec and Izzy capture Iris. Consul Penhallow post-humously pardons Clary of her crimes. Penhallow wants to convict Alec for his crimes, but she can't since people see the NYC Institute as heroes. She plans to keep a close eye on them. Penhallow denies any allegations of the Gard torturing Downworlders. Meanwhile, two masked figures inject the Seelie from earlier with a strange liquid; his veins and eyes glow. Magnus asks Alec to teach him how to fight without magic. Maia and Simon make uncomfortable peace with each other. Maia will check on the Pack while Simon will venture into the sewers. Jonathan plans to take the apartment to Paris. Clary stabs him through the jaw; she experiences the same wound. He uses his stele to heal himself, which heals her too. Their life forces are bonded to each other.